Claimed line honours in last year’s race, repeating her success from 2015 and in the process breaking the course record. Owner Jim Cooney has once again assembled an all-star crew headed by ace helmsman Jimmy Spithill and Volvo Ocean Race offshore veteran Brad Jackson with the team on the top line of favouritism for another line honours title. 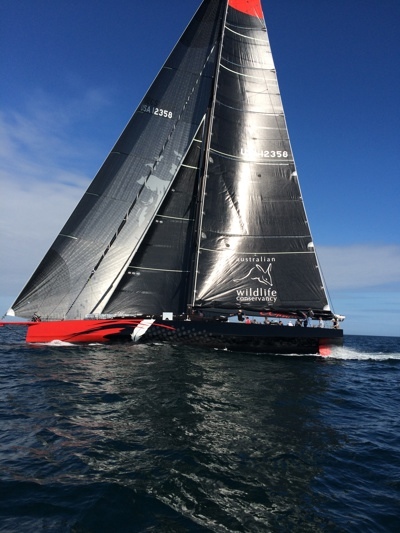 Crew have been working hard to lift their light-air performance and already have been impressive in capturing line honours records in both the Sydney to Newcastle - Bass Island Yacht Race and Flinders Island Race. Also taking line honours in the recent Cabbage Tree Island Race. She was built to break records and in 2015 set a new monohull speed record covering 618.01 nautical miles in 24 hours at an average speed of 25.75 knots. A new race record is not beyond her, or any of the other super maxis.